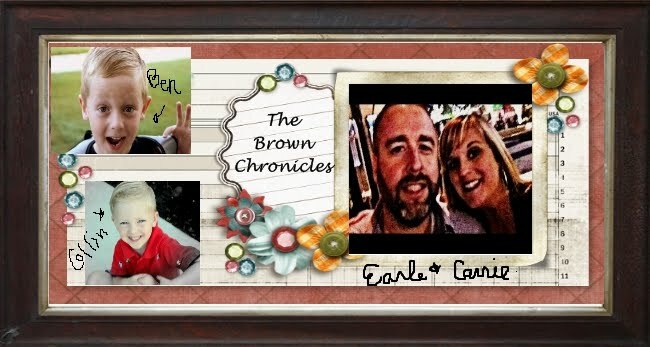 -A system to establish and maintain a healthy state of kindness in the Brown home. Note: This is not a system of rewards, but a mere system of amiable citizenship in a family. Your rewards are the ability to feel good about yourself by acting kind to others. Also, by being kind, you will be able to continue enjoy normal privileges in your daily life. · Each brother will start each day with 3 K.I.N.D. points. The goal is to keep all of those points during the day, and if you lose some points, the goal is to earn them back. · If you are unkind to your brother or parent, you will get docked one kind point per infraction. · The loss of one point during a day will be a stern and official warning. · The loss of two points will be the loss of a greatly desired privilege until the two points are earned back. At that point the brother will regain the lost desired privilege. · The loss of three points will result in a 24 hour period(1 full day) loss of a favorite privilege or pass time, but you can still earn kindness points for good measure. · You can earn back kind points by being kind to your parent or brother. You can also earn fast service kind points by serving your brother or parent by bestowing on them a selfless act. Hitting, kicking or physically hurting your brother in any way that is not an accident. Other large acts are yet to be defined in this category but will be left to the subjection of the parents. Remember, nice dudes are happy dudes. The purpose of the K.I.N.D. System is to promote the desired behavior of your child. In this case the desired behavior is being kind to others. So in order to promote this behavior, your child needs to be able to identify and define behaviors that are not kind, and behaviors that are kind. We should not assume that our kids instinctively know this. We have to teach them. This is the whole purpose of the K.I.N.D. journal. · In each child’s journal the parent needs to clearly state the rules of the system. This can be as easy as printing it out and attaching it to the back of the cover of the notebook. · The first entry should happen right after you explain the rules of the system. Each child should write out the date and their top five privileges and pass times for that date. You will need to do this every couple of weeks because this variable constantly changes, and certain things become more important or less important to your child. · The child should date each day. And write in 3 points on that date. · Every time your child gets a point deducted he/she needs to write -1 and explain how they lost that point. · Also, as each point gets earned back, the child must write down how he earned back the point. · If you child has a 3 point infraction, of course have them write down what they did, but also the time of day it occurred, because this starts the 24 hour process of loss of privileges. · Also, have children write down any points earned back by fast service and selfless acts. Love these pictures. We are lucky that Ben is missing his two front top teeth for these photos:). I love it. He is about to lose the two on either side too, so it makes for a great memory. Got the idea for the Age/Info photo from, http://www.flickr.com/photos/lisalucky/3589299142/. Wish I could take the credit but I cannot. I found it from browsing pinterest. Ben was quite excited about today. Collin was quite sad that his brother was going without him. Bless them. What fun they are! Thank you Mama Cindy for their fun new backpacks and gear! We stayed in Houston for most of the summer this year. It was good! We enjoyed lots of stay cation time. We did make a trip to Kentucky to see my family and one to Kilgore to see Earle's mom around Memorial day. I'm so behind on all of our postings that I think I'll just go ahead and post all the different pictures that I took with my phone. Be prepared this will be a marathon of pictures ahead. I just also posted a few of the pictures that the boys have taken on their camera this summer. Be sure to click onto "Ben's Musings" and "Collin's Candor" pages to see what has been going on from their perspectives. Winter is here ... it promises! Drew's First Day of Kindergarten! mE OH my, WhaT a MaY! Last Post on This Site: Time to Migrate! How do I get a do-over?